Learn more about Andy “La Máquina” Andras, the Guinness World Record holder for 24 hour distance longboarding, and the 3-Step Process. Longboard Therapy: A Relational Utilization of the Mind-Body Connection. By Isaac Farin, Ph.D., LMFT. 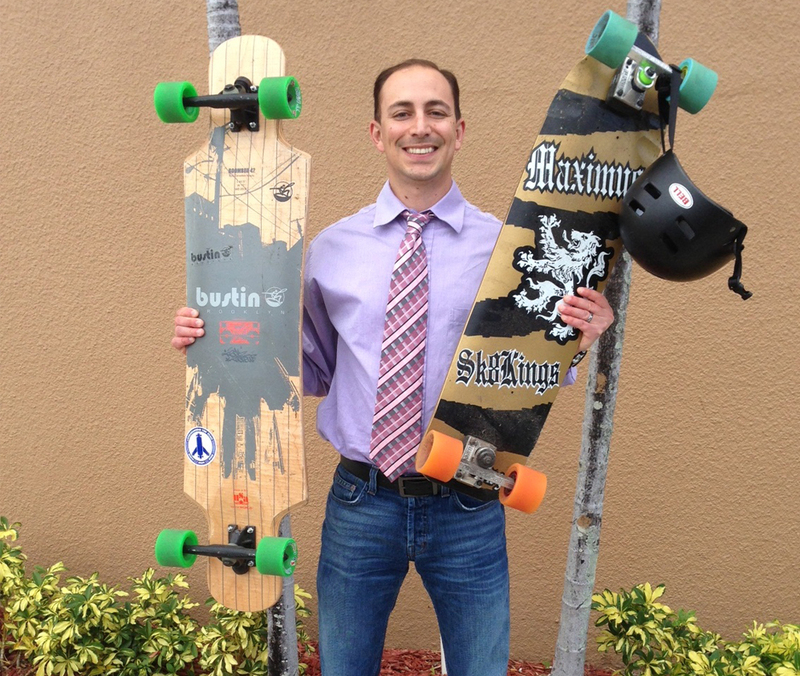 When Isaac Farin, a marriage and family therapist in North Miami Beach, FL, started skateboarding on a longboard (a long skateboard with wide wheels) in parks for fun, he found it to be an incredible outlet for stress relief. Isaac Farin, M.S., LMFT, a doctoral student in the Department of Family Therapy (DFT) in NSU’s School of Humanities and Social Sciences (SHSS), uses his concept of “Longboard Therapy®,” developed with Jonathan Strauss, the founder of the International Distance Skateboard Association, to provide an additional dimension to his Solution Informed Mindfulness Therapy (SIMT). 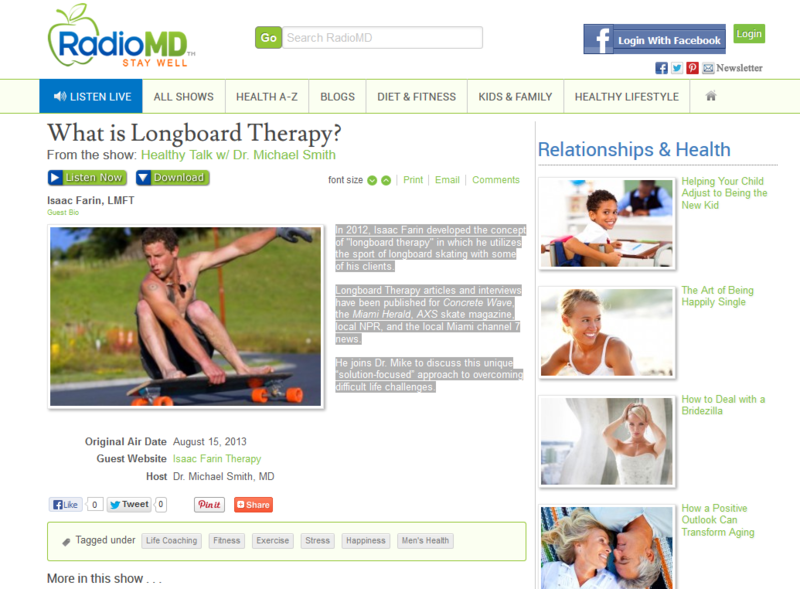 A few months ago, following the publication of an article in the Miami Herald about longboard therapy®, I received an email from Josh asper, a longtime pro skater from San Diego, Calif. 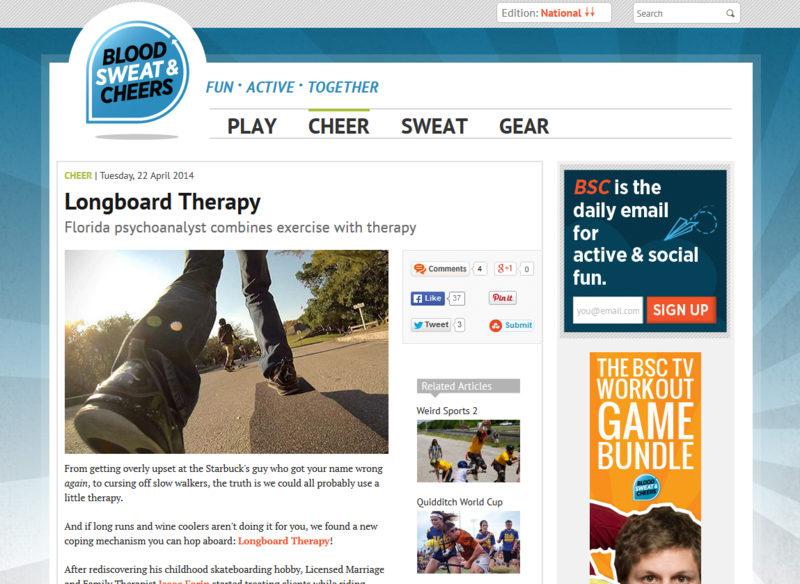 In it he shared his intrigue with the idea of longboard therapy® and thanks me for the work I do as a therapist. When I first received a call from Alexis' mother, I had no idea if Longboard Therapy® would be the most therapeutic option for her. Alexis was 22 years old and already had two open-heart surgeries. Her mother described her as having fears and phobias, anxiety, intruding thoughts, obsessive-compulsive behaviors and a major fear of illness. 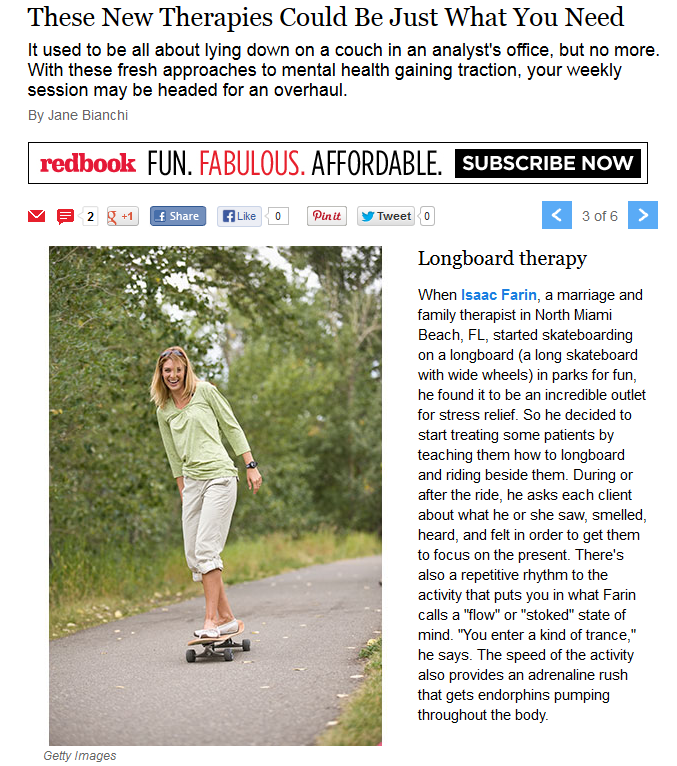 In 2012, Isaac Farin developed the concept of "longboard therapy®" in which he utilizes the sport of longboard skating with some of his clients. 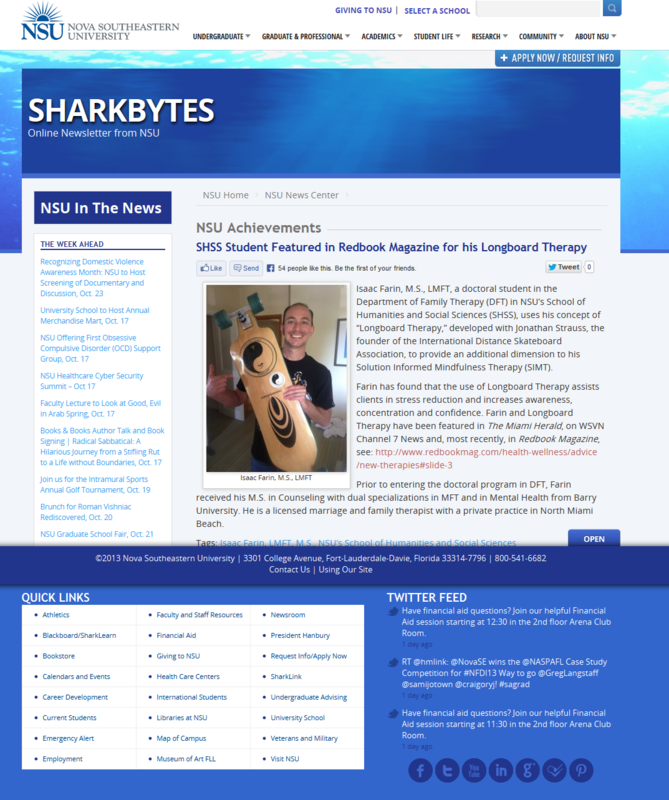 Longboard Therapy® articles and interviews have been published for Concrete Wave, the Miami Herald, AXS skate magazine, local NPR, and the local Miami channel 7 news. 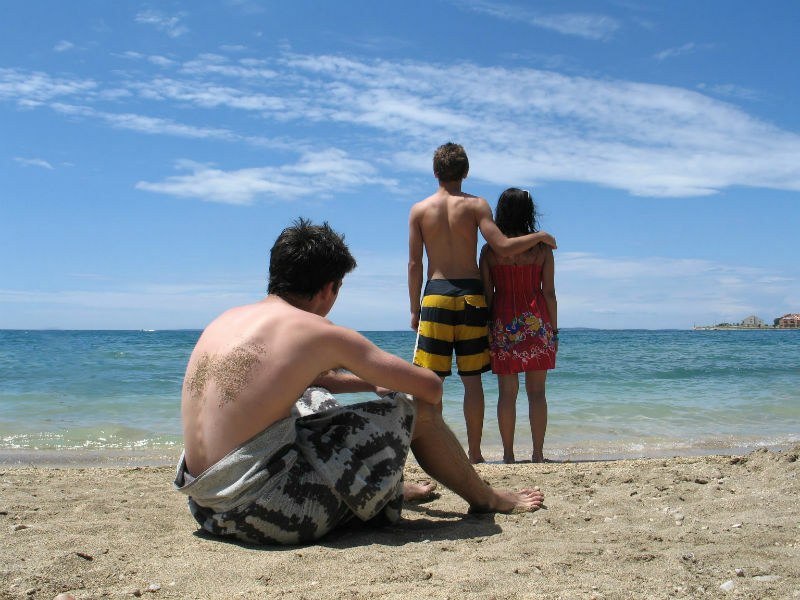 He joins Dr. Mike to discuss this unique “solution-focused” approach to overcoming difficult life challenges. 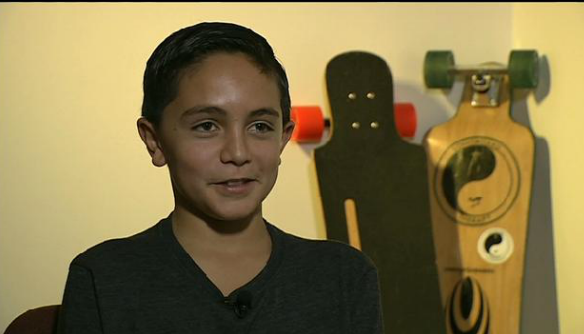 A lot of kids like skateboarding but for some, it's more than just fun and games. One local therapist is making breakthroughs with his Therapy on Wheels. 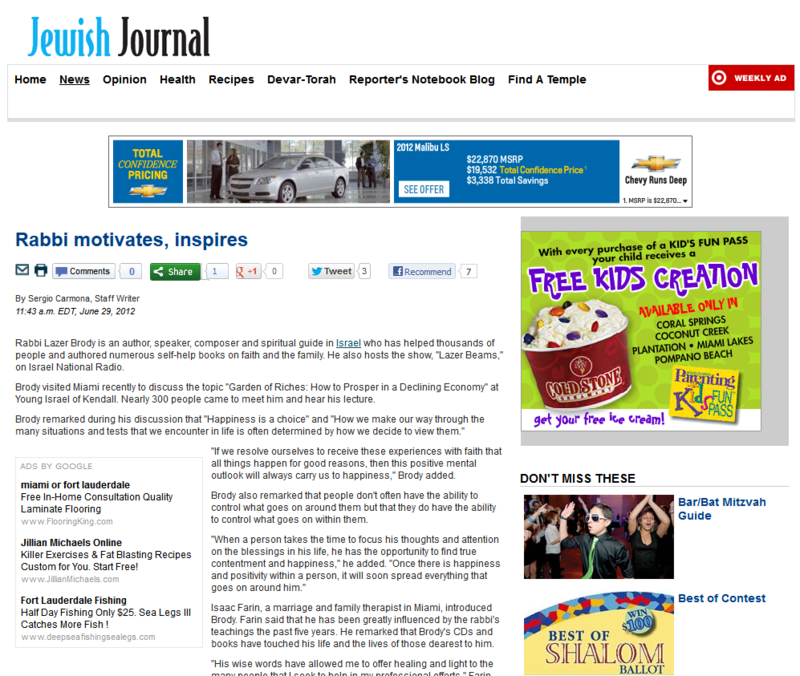 Check it out, in tonight's Parent to Parent. Move over, Freud. Your couch is being replaced by a piece of wood on wheels. On the shady slopes of pavement in Greynolds Park in North Miami Beach, a therapy counseling session is in progress. Once a week, amid the sprawling canopies of hardwood hammocks and mangrove forests, patients sort through emotions — while pushing on a longboard skateboard. 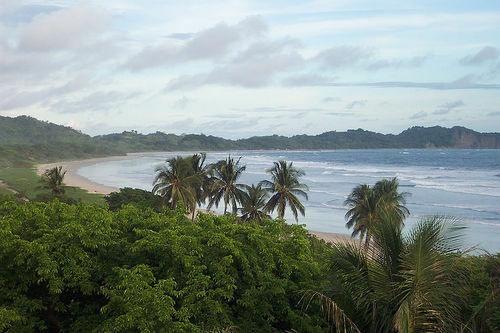 Safari Surf has partnered with Isaac Farin Therapy to present the Mind & Body Change Retreat in Nosara Costa Rica – December 3-10, 2013. 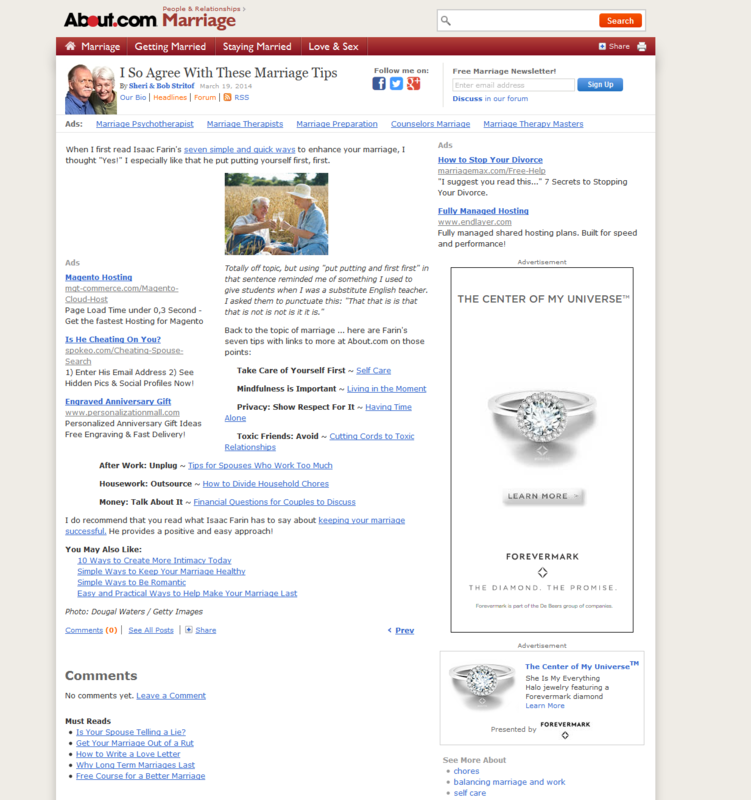 The world is changing so rapidly. Every day, banner headlines cry out another potentially earth-shaking crisis; Syria is about to go war with Turkey; El Qaida terrorists are now firing at the southern Negev from Egypt; radical Islam continues to make headway and we seem to be in a stalemate with Iran. No one knows what’s in store for the morrow. 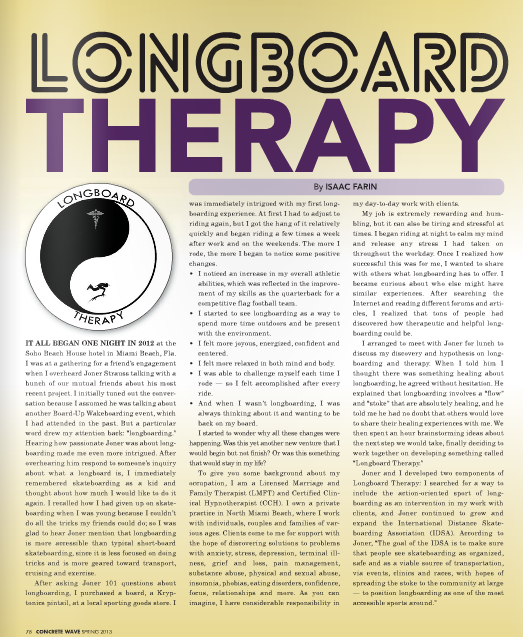 Longboard Therapy® combines psychotherapy and action-sport for new innovative way to create change. Isaac Farin Therapy LLC. has announced a partnership with Safari Surf School to offer the innovative “Mind and Body Change Retreat” in Nosara, Costa Rica. The retreat will feature positive psychology and mindfulness/meditation lectures from Isaac Farin, paired with exotic vacation experiences coordinated by Safari Surf. 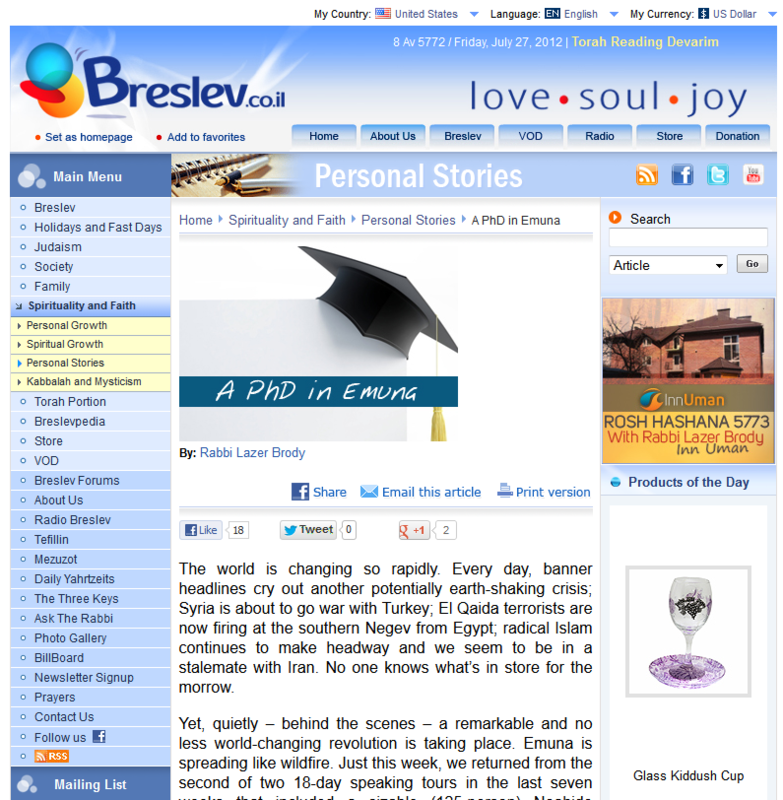 Rabbi Lazer Brody is an author, speaker, composer and spiritual guide in Israel who has helped thousands of people and authored numerous self-help books on faith and the family.